Many families would comment, "How can we talk about making funeral arrangements...?" The simple answer is... it's much easier to make arrangements when you are not in shock and grieving. In past generations, the general train of thought was, "If you don't talk about it, you don't have to worry about it." Over the years, this thought process has changed. From estate planning to pre-arranging your funeral, it is best to be prepared for anything life offers. Pre-planning allows you to take into consideration many of the choices and gather the information required to plan a funeral. Consideration of these items at your leisure, with the advise of friends, family, and professionals, and not during the compressed time requirements when a death has occurred, will alleviate some of the stress of the process. Pre-arrangements give peace-of-mind that your final requests will be followed. In addition, these arrangements relieve your children from the burden of making difficult decisions at a time when they are grieving and allays the financial burden of funeral costs. 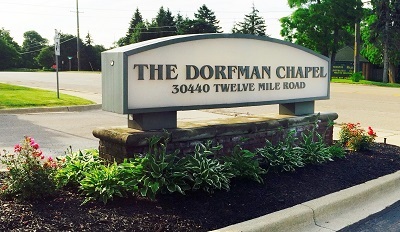 At The Dorfman Chapel, we offer only guaranteed pre-arranged funeral contracts. This means that even though the costs of funeral go up every year, the guaranteed contract protects against this inflation. Often families who have made previous arrangements with another funeral home wish to use our services. All pre-arranged funeral funds are held in escrow and may be transferred to another funeral home at the family's request. Another reason many families make pre-arrangements is to reduce a parent's assets in order to allow the Family Independence Agency (State of Michigan) to cover one's costs of living. An Irrevocable Funeral Contract is NOT counted as an asset by the State of Michigan, so it is advantageous to make arrangements before the person's funds run out. Currently, when someone has under $2,000.00 in assets, the state will provide for the individual. Many families make arrangements in order to lower a parent's assets so the state will provide assistance. This allows a parent to provide funds for his or her own funeral. If the parent does not make pre-arrangements and the funds run out, then the financial burden falls on the deceased's children. The state currently (as of January 2014) allows an individual to spend up to $11,970.00 for a funeral. Not only can funds be put away for the funeral but also for other items not always associated with the funeral such as a proper monument or gravemarker and perpetual care of the grave. If you have any questions regarding pre-arranging a funeral, or transferring a previously made contract from another funeral home please do not hesitate to call us. Alan or Jonathan Dorfman would be happy to discuss any questions you might have. The Dorfman Chapel is pleased to offer you an "Advanced Planning Information System" to help you in determining the information required and options that need to be chosen to effectively plan or pre-arrange a funeral. Usage of the system will help both you and the funeral director in fulfilling your needs.